I love weddings (obviously!) and everything they stand for – romance, love, commitment, tradition, families…. But I have also long been conscious that today’s weddings result in a huge amount of waste and damage to the environment. Something I think we all know cannot continue. Which is why today I couldn’t be more thrilled to be sharing some fabulous ideas from Clean Origin for ways to create a more eco considerate wedding…..
A green revolution is on the rise and couples everywhere are on a mission to incorporate more and more eco-friendly elements into their wedding day. No matter the size or location of your special day, here’s five easy ways to help make your wedding more environmentally friendly! Although there may seem to be a ton of options for ethical engagement rings, if you’re hoping to include a diamond, the options become much more limited. In reality, the only way to have complete peace of mind that your diamond ring is 100% ethical and eco-friendly is to go with a lab-made diamond. Lab-created diamond companies, such as Clean Origin, offer a new mined diamond alternative that has all the same chemical, physical and visual characteristics (all the sparkles! ), but without any of the ethical or environmental negative impacts of mined diamonds. You can browse their stunning selection of vintage inspired engagement rings here…. Oh and did I mention, lab-grown diamonds can be anywhere from 20-40% less expensive than mined stones? Which means you have the option of either saving a few $s for your big day, or being able to afford a bigger diamond if you go man-made! Time to head to the thrift store! Although it can be tempting to purchase new items that were made to resemble a vintage piece, it’s much more eco-friendly (and affordable) to recycle real vintage elements! For starters, talk with your parents to see if there are any family heirlooms that could be used on your special day. This not only incorporates sentimentality, but it cuts down on items that you might just end up throwing away! Finding anything from mismatched centerpieces to your mother or grandmother’s wedding dress will also be great talking points for your friends and family. If you can’t find anything pre-owned to use, do some research for the best local thrift stores or pawn shops. Buying pre-owned items is still a form of recycling and often times you can find things that you would never be able to buy brand-new! When your wedding day is over, find another bride to pass your decorations to! 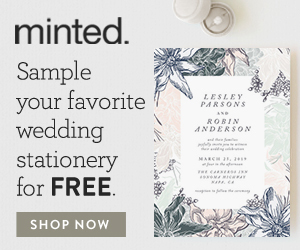 From save the dates to paper fans, it’s easy to forget just how many paper items go into your wedding day and all the events surrounding it. An easy way to ‘go-green’ is to find a company that can supply all of your paper goods on recycled material. Somewhere like Etsy or Paper Culture is a great place to start! Now, we know what you might be thinking, “anything that’s recycled is going to either be more expensive.” Although this might be true, since you’ve already saved money buying your lab-grown diamond engagement ring, you can put those extra dollars towards recycled paper products! It’s a win-win! If you’re planning a vintage wedding, what’s more perfect that setting the mood with candlelight?! There are tons of gorgeous ways that you can incorporate candles (real or fake) into your ceremony and reception that will not only awe your guests, but create an incredibly romantic ambience. The eco-upside? Cutting down on electricity! Even if you’re using a venue that covers the cost of electricity, you can still know that you did your part to help lower their use. Flowers have become a HUGE part of weddings in the past few years. Although they’ve always been an important element, having large floral centerpieces, flower crowns and extravagant bouquets are now all the rage. But what happens to all of those flowers when you’ve said “I Do”? A great way to make use of your florals is to donate them the day after your wedding. Find a local nursing home or preschool where they can be admired and taken care of. If you keep your plants potted on your big day, you can even donate them back to a nursery to re-plant! Weddings are extremely joyous occasions. They are a celebration of love. But no matter their meaning or their size, they can still create a good amount of waste. Using these 5 eco-friendly tips can help cut down on unnecessary purchases and disposing of too many items, which will save you money as well as reduce the environmental impact of your big day when all is said and done! Clean Origin is a much loved Chic Vintage Brides Sponsor but you can trust that I only publish on these pages the work and creations of people and companies for whom I have a genuine love. Thank-you for supporting CVB’s Sponsors! If you are in the wedding industry, feel CVB’s brides would love what you do and would like to learn more about the various opportunities available for appearing on these pages, please visit my Advertise page and email me at amy@chicvintagebrides.com.